Is CCTV creeping too far? For the last 25 years CCTV has proliferated into public spaces across the UK, but is it going too far to use cameras to give parking tickets and enforce bus lane rules? When most people think of CCTV being used in law enforcement they think of a string of high-profile crimes that have been solved or publicised with the help of footage. The video of James Bulger being led away to his death or of the 7 July suicide bombers on their way to London stick in the mind. But CCTV has grown far beyond this. No-one knows precisely how many cameras there are in the UK, but the estimates go as high as 4.5 million, making Britons among the world's most watched people. Now the issue of CCTV is to be taken up by the government in its upcoming Freedom Bill. At the Queen's Speech it was promised the measures would be aimed at "protecting privacy by introducing new legislation to regulate the use of CCTV". The CCTV User Group, representing all the public bodies which have cameras, reckons there are 1.5 million overlooking public spaces in the UK. But it is a surprising fact that there are very few regulations over how CCTV is set up and run. Everyone has to comply with the Data Protection Act, but apart from that it is often a matter of guidelines rather than law. I was caught by a CCTV camera as I pulled into a bus stop for a few seconds to let a friend out. A week later a £100 fine arrived. The London Borough of Wandsworth has led the field in CCTV and uses 71 cameras to enforce parking and traffic infringements. Camera 722, outside Clapham South underground station, has caught an average of 23 drivers a day straying into the bus stop. This single camera was on course to rake in a million pounds a year for the council. Ignoring official guidelines on the use of CCTV cameras, Wandsworth Council had not put up signs warning people that the camera was operating there. "Drivers who are being caught know they shouldn't be parking in these places," said a Wandsworth council spokesman. "But they do not seem willing to park 50 yards further up the road. They won't get a ticket if they park properly." Camera 722 was one of hundreds paid for by the Home Office to cut crime. It was never meant to be used against motorists. I resolved to go down every possible avenue of appeal - the Parking and Traffic Adjudicator, the Information Commissioner, and finally the Local Government Ombudsman. All listened politely, but it seemed that Wandsworth Council had stuck to the letter of the law. I did score a moral victory when they eventually put up a warning sign. But I didn't get my £100 fine back. One area that irks many is the use of cameras against drivers committing minor infractions. By 2003 cameras started to be trained on places where motorists were stopping illegally, driving in bus lanes or straying into box junctions at busy road intersections. Today, they bring millions of pounds into councils' coffers. In March 2008, councils effectively got powers to use CCTV for parking enforcement. But should it be used in this way? For many people, the original intent of CCTV proliferation was to improve security and reduce crime in public places. "They are used for the most minor infringements - people who have gone into a bus lane in order to pass someone turning right," says Hugh Bladon, a founder member of the Association for British Drivers pressure group. "That sort of thing is plainly absurd. Whatever you do, you are going to get fined." The proliferation of the cameras has prompted small, dedicated pressure groups to take action. Big Brother Watch and No CCTV are the most notable. "It is another way of policing by remote control. We are using blanket surveillance for strict liability offences," says Charles Farrier of No CCTV. "We get people saying they parked a car with a disabled badge in the window and they incurred a fine because the camera couldn't see the badge. A real person on the street can talk to people and engage with people." CCTV is everywhere, both public and private-run. It is in hospitals, universities, car parks, buses, trains, shopping centres and pubs. It is even mobile, with many councils in London, and a handful outside the capital, using CCTV cars to film traffic offences, such as driving while using a mobile phone. There are 54 CCTV cars patrolling 31 local council areas, according to Big Brother Watch. But could CCTV "creep", including the use of them to punish people who drop litter or fail to clean up after their dogs, threaten public support for a vital crime fighting tool? "Public support for CCTV is vital and using them to target things like parking infringements does not help," says Chief Inspector Mick Neville, the Metropolitan Police's expert in catching criminals using CCTV. "We lead the world at catching robbers, burglars and other offenders with CCTV images, so I am keen that as many cameras as possible are focused on protecting the public by watching criminals, not targeting motorists." Of course, there are plenty of people who believe it's fair enough to enforce bus lanes in this way. "People are right to be concerned about the overuse of CCTV, but in this case it serves a useful purpose," says Richard Bourn, Campaign for Better Transport's London campaigner. "Bus lanes are important to keep traffic moving and encourage people to take the bus or cycle instead of driving. If you observe the law you have nothing to worry about. People who obstruct the flow of traffic by driving or parking in bus lanes are being anti-social and disrupting everyone's journey." And the CCTV User Group is convinced the general public still like CCTV. Its director Peter Fry points out: "Our most recent survey shows that 90% of the public support local council cameras and 80% said they didn't feel their privacy was infringed by CCTV. Most people feel reassured by the presence of cameras, especially when they see news reports about how they have contributed to convicting criminals." An analysis by the Campbell Collaboration group of 44 studies on CCTV found that cameras have a modest effect on preventing crime, with the most marked impact on vehicle crime, and a much less significant effect on violent offences. A Home Office study in 2005 found huge support for CCTV generally with 82% backing its introduction in their area. But there are underlying assumptions that it should be for certain things. 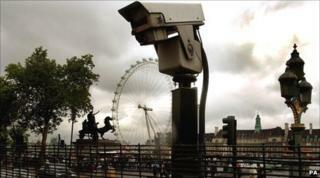 And even as far back as 1992, over a third of people in a survey thought that CCTV cameras do invade people's privacy. And their use in some circumstances will always be controversial.